This is the 20th anniversary of the beloved 1995 Pride and Prejudice miniseries, so we’re looking back at that version and Jane Austen’s world. This is the next in a series of posts about this classic adaptation! Pride and Prejudice. Talk to anyone interested in historical costume movies, and you don’t even generally have to mention “1995” for them to know which version you’re talking about: COLIN FIRTH. JENNIFER EHLE. The version that takes its time telling the story, and tells the story RIGHT (no pigs here). Of course, the fact that the 1995 production has really nice costumes helps. Designed by Dinah Collin, they’re pretty darn true to the Regency era (with some exceptions, which we’ll discuss). They’re also well designed and well made from a story/character standpoint as well. So in honor of the 20th anniversary of the only Pride and Prejudice that needs mentioning, let’s look back at the costumes: what was the design process, how were the costumes made, and how did they work in the finished product? Dinah Collin started her research by looking at surviving garments, fashion plates, and other material in museum collections across the United Kingdom and even Rome. She aimed to get the overall look of the period correct, but, she said, “I don’t think it’s essential to be slavishly historically correct to the letter. I like to find that step between them and us, translating between the two flavours. It has to appeal to people in the modern day” (“Silk and Sensuality,” Sydney Morning Herald, March 6, 1996). For example, although Colin Firth’s wardrobe was accurate, “pieces were selected that looked like clothes that could be bought in the modern era” (Designing the Costumes, Pride and Prejudice, BBC). (Apparently this was successful, as the designer received many letters from men asking where they could purchase Darcy’s linen coat! [“Silk and Sensuality”]). Mr. Darcy in the linen coat that was so popular. Lydia (Julia Sawalha), looking comfortable in her costume. Any film/TV production has to think about characterization. The costumes aren’t just supposed to (hopefully) look like they’re of the time, place, and station of the character. They have to serve as a short-hand to help the audience understand the different characters’ personalities and motivations. This version of Pride and Prejudice did a very good job at basing the costumes in the era, but then tweaking them for purposes of characterization. One of the biggest character contrasts needed to be between the uber-rich, London-based Bingley sisters (Caroline Bingley and Mrs. Hurst) and the still-well-off, but less-so, and country-based Bennet sisters. Designer Collin acknowledges that the Bingley sisters would, historically, have most likely worn the white muslin dresses that were incredibly fashionable in the period. However, she needed a visual shorthand to differentiate the two groups, so the Bingley sisters were dressed in bright colored silk gowns with lots of embellishment. Collin said, “The extent of their adornment needed therefore to be greater. I did this with bright yellow and cerise pink silks, feathers and brooches” (“Silk and Sensuality”). Dinah Collin’s sketch for one of Caroline Bingley’s costumes, together with the finished result. In the video Pride and Prejudice 15 Years Later (which is definitely worth a watch! ), Collin specifically mentions this orange dress worn by Caroline. She was worried that it was too bright, but felt that on screen, it was perfect. The Bingley sisters wear strong colors with lots of bling and ornamentation. Caroline (Anna Chancellor , left) wears the bright orange dress that Collin mentioned. The Bennet women in light-colored, cotton dresses. The director of the series, Simon Langton, was influential in this decision. He said, “I wanted pale colors or creamy whites for the girls, to reflect both their zest and innocence. This meant that we could keep the darker, richer colors and exotic fabrics for characters like the Bingley sisters or Lady Catherine De Bourgh” (Pride and Prejudice: 1995, JaneAusten.co.uk). Lady Catherine de Bourgh (Barbara Leigh-Hunt) also wears strong colors and silk fabrics. Apparently there is a “small dead bird” in Lady Catherine’s hat, which calls back to the paintings of slaughtered birds at Rosings Park and also “a visual comment on the predatory nature of Lady Catherine’s world” (Sue Birtwistle & Susie Conklin, The Making of Pride and Prejudice [Penguin Books, 1995]). Looking at specific characters, Elizabeth (Jennifer Ehle) was dressed in earth tones to emphasize “her practicality and active nature” (Designing the Costumes). Collin wrote, “I chose colours that had an earthiness to them — a lot of browns, for example; I particularly liked her in a curry colour… Overall I wanted a nice, straightforward look that was pretty but not fussy” (The Making of Pride and Prejudice). Elizabeth (Jennifer Ehle) wears earth tones to emphasize her grounded nature. When it came time to making the pièce de résistance, Elizabeth’s wedding dress, Collin was careful to make sure that her dress was believable given the Bennet’s station (although something tells me Darcy kicked in a bit of money towards this dress): “We checked archives and visited museums to find out exactly what a girl would have worn. If their family was short of cash, a bride would often wear her best dress, but if you could afford it you had a white wedding dress specially made” (“Something Old, Something New; Preview of Two TV Weddings,” Daily Mirror, October 28, 1995). For Mr. Darcy, the emphasis was on dark colors (particularly dark green and gray), leaving warmer colors for Mr. Bingley. 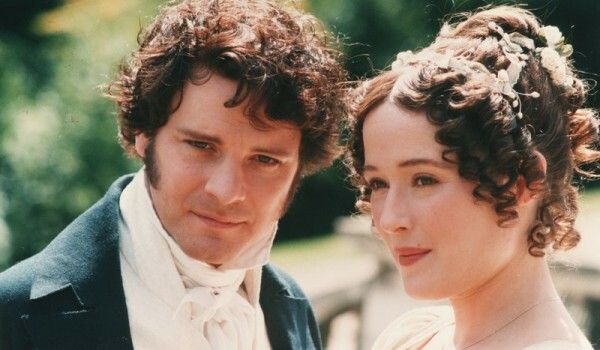 Colin Firth specifically requested to look “saturnine” (The Making of Pride and Prejudice). Collin researched period fabrics at the Manchester Galleries (Pride and Prejudice 15 Years Later). She started by looking at purchasing Indian fabrics, as their designs are often similar to those used in the period. “I had some very good Indian suppliers with traditionally based, very fine materials. The printed fabrics needed to be very, very fine. Saris were very useful, particularly a white wedding sari” (“Silk and Sensuality”). But in general, most of the Indian fabrics had prints that were too recognizably modern, so she had fabrics custom-printed by a friend’s daughter at her college (Pride and Prejudice 15 Years Later). Collins wrote, “…We didn’t want to make them too simple, which would have been a shame for characters like Mrs Bennet, for whom we wanted more feathery prints. So we went through absolute torture before they came out properly” (The Making of Pride and Prejudice). The custom fabrics were screen-printed, which meant that they couldn’t be ironed! Elizabeth’s dress may be one of these custom-printed fabrics. Almost everything had to be made for the production, given that there were few film/TV costumes of the Regency era available for rental (and it’s certainly not an era in which you can do vintage!). One exception was the men’s uniform jackets, which were sourced from Italy, as there wasn’t time to create them in-house (Pride and Prejudice 15 Years Later). Wickham (Adrian Lukis) wears an Italian-made uniform jacket. Although few (if no) rental costumes were used, Cosprop’s costuming making facilities were where the Pride and Prejudice costumes were made. Collins wrote, “The great advantage of Cosprop, our costumier, is that you can draw on a tremendous amount of expertise all in one place, as they employ thirty-five highly skilled people” (The Making of Pride and Prejudice). The production chose for the “new to hire” option, which meant that after the filming of the series, the costumes would go into Cosprop’s rental stock. Collin and her team had about two months to make the costumes before shooting began. 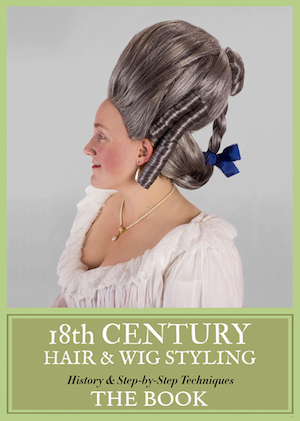 In the end, costumes and wigs cost more than £10,000 a day (“Price and Prejudice,” Daily Mirror, September 25, 1995). Many of the actors, including Jennifer Ehle as Elizabeth, wore wigs. The main female stars had their wigs custom-made, while the rest came from the BBC’s stock (Pride and Prejudice: 1995, JaneAusten.co.uk). The hair and make-up design was done by Caroline Noble, and the custom-made wigs were done by Ray Marsten. 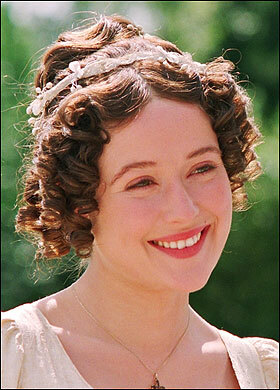 Jennifer Ehle as Elizabeth definitely wore a wig for the production. Alison Steadman (Mrs. Bennet) also wore a wig. Shoes were copied from extant originals (Pride and Prejudice 15 Years Later). A real Regency shoe, a reproduction of which was worn by Julia Sawalha as Lydia. One of the more interesting aspects of the production is that the actors playing the Bennet sisters were able to treat their daytime costumes as a wardrobe. I’m sure there must have been continuity concerns, but beyond that, supposedly the actresses were able to wear whichever dressed they preferred for a given scene. Jennifer Ehle said, “There was one little dress that I used to wear a lot – just as today you would pull on a favorite pair of Levi’s or a well worn T-shirt. You don’t often get the chance to have a choice like that, and I was very grateful. My daily mix and match became part of the pleasure of making the series” (Pride and Prejudice: 1995, JaneAusten.co.uk). This is one of my favorite of Elizabeth’s dresses. I wonder if it was Jennifer Ehle’s, too? So far, I’ve mostly focused on costume designer Dinah Collin’s vision for the costumes. To what degree do they align with the historical period? In general, Collin and her team get the Regency era right: — Pride and Prejudice was published in 1813, so it’s usually assumed to be set between 1810-13 (although the pig version harkens back to the period of Austen’s first draft in the 1790s). There are a few elements that aren’t quite precise for the period. Cassidy of Mimic of Modes has a good run-down on these, including low-necklines worn for daytime, a somewhat incorrect bust/corset shape, necklines that are the wrong shape, and fashion-forward hairstyles. I’d like to elaborate on a few of those, and talk about some of the things that they DID do right — all while acknowledging that I am FAR from a Regency expert, so please chime if you have thoughts/knowledge! Aside from the “rich people in bright-colored silks, less-rich people in light-colored cottons,” one of the biggest deviations (although not THAT big, as we’ll see) is in terms of daywear necklines. Most of the characters, particularly the Bennet sisters, wear low necklines for “morning dress” (which in the period translated to morning and early afternoon). In the period, morning dress was almost always high-necked, or low-necked and filled in with a chemisette (a white, ruffly, sheer dickie). “Morning dress,” Ackermann’s Repository of Arts (August 1810). Lydia, Elizabeth, Jane, and Elizabeth again in low-necked day dresses. Jane’s short sleeves are particularly egregiously inaccurate for daywear. “Walking Dress,” Ackermann’s Repository of Arts (June 1809), with a low neckline filled in by a chemisette. Mrs. Bennet (almost always in a chemisette), and Lydia and Kitty (who rarely wear these, but hey, they did here!). The necklines were clearly an issue of characterization, because there’s one Bennet sister who actually wears high-necked morning gowns most of the time: Mary. Clearly she’s supposed to look dowdy, which, yeah, it’s not a great look by modern standards. She joins Maria Lucas (who is young) and Mrs. Gardiner (older) in wearing much more accurate high-necked gowns. None of these characters are in any way competition for Elizabeth, Jane, Kitty, or Lydia, and the necklines help in that. “Morning Dress,” Ackermann’s Repository of Arts (November 1809), with a high neckline. Maria Lucas, Mary Bennet, and Mrs. Gardiner, all in high-necked day gowns. Mrs. Gardiner, in particular, dresses in a very historically accurate style. She has more money than the Bennets, and lives in cosmopolitan London (even if it’s Cheapside), but I think the fact that she’s an older lady plays a large part in why she gets so covered up. Mrs. Gardiner isn’t wearing the same thing at all as this portrait, but it’s a similar effect. (Right: Dorota Czartoryska née Jabłonowska by François-Xavier Fabre, 1811, Wikimedia Commons). Left: Lady Mary Templetown and Her Eldest Son by Thomas Lawrence, 1802. Right: Georgiana Darcy and Mrs. Gardiner (real-life mother and daughter). Next let’s look at outerwear. The Bennet sisters generally wear spencers, a short, waist-length jacket. These are very much of the period, except that they too sometimes have a low neckline, which generally catches my eye as “wrong.” However, I did some poking around and found at least one Regency fashion plate showing a low-necked walking dress (below), so my eye is clearly (somewhat) wrong! “Afternoon Promenade Dress,” La Belle Assemblee (June 1, 1813) makes me give Elizabeth’s (right) low-necked spencer a pass. Nothing makes me give a pass to Jane’s (middle) low-necked AND short-sleeved spencer, unless that’s just an over-bodice meant to be worn indoors. An excellent compromise was made when Dinah Collin put many of the characters — particularly Elizabeth — in technically high-necked spencers that were worn open. As someone who hates a bottom-of-the-throat neckline, these are pretty AND historically accurate. Ladies Magazine (December 1812). Kitty and Lydia in high-necked spencers (Kitty’s has been recycled into MANY other shows/films), and Jane in a high-necked pelisse. “Walking Dress,” Ackermann’s Repository of Arts (June 1809). Elizabeth, dressed for summer walking at Rosings Park, has a similar effect. Now let’s switch gears and talk evening wear. In general, I think the film does a great job here. The Bennet sisters look pretty much just-stepped-out-of-a-fashion-plate. 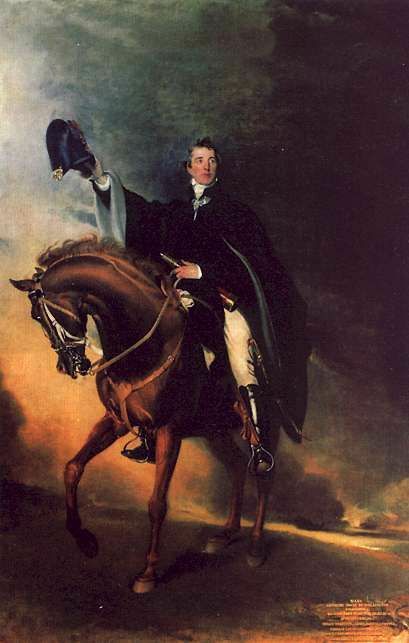 (On a side note, the fashion plate below is a good example of the unique Regency bust silhouette — high and separated — that the film did not do). “Evening Dresses,” Ackermann’s Repository of Arts (January 1, 1811). Lydia, Elizabeth, and Jane dressed for the Netherfield Ball. The Bingley sisters stick with their bright-colored silk look for evening wear. Of course, such styles are period-accurate, it’s just unlikely that someone would stick so firmly into the bright-color camp (and not dabble in the white-cotton camp). Colored dresses DO turn up in fashion plates and other records. “Evening Dress,” Ladies Magazine (January 1812), Mrs. Hurst, Miss Bingley, “Half Dress,” Ackermann’s Repository of Arts (February 1809). Princess Augusta by William Beechey (c. 1802), Buckingham Palace. Jane Bennet and Mrs. Hurst in similar styles. “Evening Dress,” Ackermann’s Repository of Arts (January 1810). Caroline Bingley and Mrs. Gardiner in longer-sleeved evening gowns. Georgiana Darcy in a ruff-esque collar. The Duchess of Clarence, later Queen Adelaide by Samuel Raven (c. 1818), Art Gallery of South Australia. “Full Dress for a Gentleman” (ie most formal), Ackermann’s Repository of Arts (April 1810). 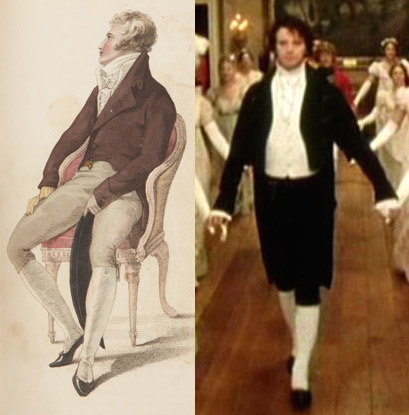 Mr. Darcy at the Netherfield Ball. Joseph Stannard as a Youth by Robert Ladbrooke (c. 1816), Norfolk Museums Service. Martin Archer Shee by William Roscoe (1815-17), Walker Art Gallery. Mr. Darcy and Mr. Darcy. MR. DARCY GANG SIGN, YO. What do you think of the costuming in Pride and Prejudice (1995)? What’s your favorite outfit? Wow, it’s funny how much like twins — in facial structure, not just costume — Joanna David (as Mrs. Gardiner) and Dorota Czartoryska née Jabłonowska (of your picture) look! My all-time favourite Austen adaptation. Darcy is perfectly attired. I love how the Bennett sisters’ clothing seemed so light and airy. Free even and how Lady Catherine’s and the Bingley sisters’ clothes seemed more confining and constricted movement. Less freedom no matter how beautiful they were. It said something about Regency society. What about a week devoted to Colin and Darcy? This was so interesting and very well researched! This was delightful! But I am curious about the dove grey/silver cloak that bride Jane wore at the end – I just adored it and always thought it was a great way for a winter bride to partially cover up when outside – I always suggest it to friends who are marrying late in the year, which results in me getting very odd looks. It is just so elegant. But is it accurate? Also, please do the hats! I must now! I love the bonnets worn at the wedding, and I swoon when I see Lady Catherine’s bonnet with the high tapering crown. Like a fancy-schmancy with hat!!! Hi! Having made a few of the costumes for this production when I worked at Cosprop, all the patterns were made in-house by individual makers, so didn’t use anyone else’s patterns…. Thanks for the info! Always exciting to hear from the designers and makers! Talk to anyone interested in historical costume movies, and you don’t even generally have to mention “1995” for them to know which version you’re talking about: COLIN FIRTH. JENNIFER EHLE. The version that takes its time telling the story, and tells the story RIGHT (no pigs here). The 1995 was a television miniseries that was almost six hours, not a movie. So naturally, it had the opportunity to take its time in telling Austen’s story. When it came time to making the pièce de résistance, Elizabeth’s wedding dress, Collin was careful to make sure that her dress was believable given the Bennet’s station (although something tells me Darcy kicked in a bit of money towards this dress): “We checked archives and visited museums to find out exactly what a girl would have worn. If their family was short of cash, a bride would often wear her best dress, but if you could afford it you had a white wedding dress specially made”. White wedding dresses did not exist in that time period. They did not become popular until Queen Victoria wore a white gown for her wedding to Prince Albert in 1840. All brides – even those from the upper classes like Elizabeth Bennet – usually wore their best dress or one specifically created for her wedding. One of my only pet peeves about this one is Wickham’s uniform. Throughout the novel and movie, it’s made very clear that he serves in the Militia. 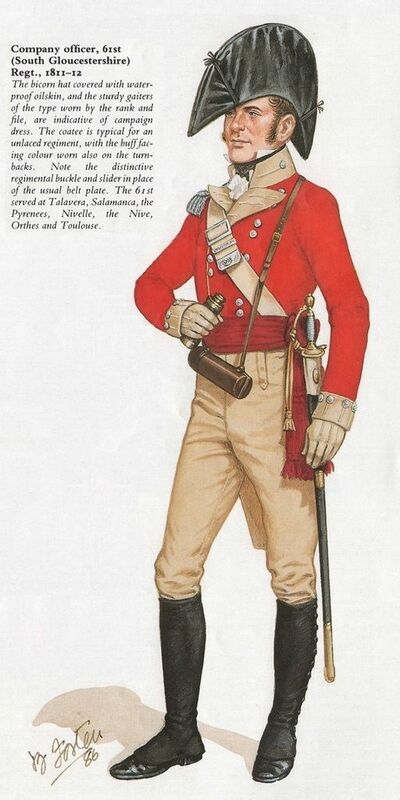 Yet the pattern of the uniform is completely based on the highly prestigious 1st Regiment of Footguards, very hard to get in socially, and highly drilled (they needed to be, guarding Buckingham Palace and all). Definitely not something Wickham could hope to aspire to. Also, he wears the belt that his sword is supposed to be on completely wrong, showing the adjusting buckle where the regimental belt plate ought to be. No, I think your initial evaluation of Elizabeth’s low-necked outfit was correct. The “afternoon promenade dress” illustrated in the fashion plate was for afternoon wear, which would have been different from — and more formal than — typical morning wear. The outfit Elizabeth is wearing in the photo is the same one that she wears as she is walking home with her family after church, so I assume that it’s meant to be day dress. The problem is not so much that the spencer is low-necked, but that there is no chemisette to fill in the neckline. Of course, low-necked morning gowns are so commonly used in films set in the Regency era that it’s hard for me to criticize P&P too harshly for this inaccuracy. I know this is a late post, but I love love love the dress Mrs Phillips wore when talking to mr. collins at a party. it had a maroonish base, but looked like it had various layers of creme netting or lace over it, which rendered various hues of maroon. I can’t even describe it properly, and can only find one small photo of it online. Yes, that’s a nice gown. It seems to have lots of ornamentation that would be appropriate for the mid-1810s. I am another latecomer to the party having just discovered this blog the other night. After watching the DVD and examining the dress going frame by frame I made a discovery: the netting overdress is a separate garment. Mrs. Phillips wears the dark red dress with the netting overdress in Episode 2 during the card party at the Phillips house. She wears the same dress minus the overdress in Episode 3 during the Christmas party at the Phillips house. The dress itself appears to be a deep red with a dot pattern which I am guessing is woven in. The dots catch the light as she moves and are visible in both scenes. The skirt is unadorned but the bodice is trimmed with what looks like narrow gold ribbon or lace under the bust. The sleeves and neckline are edged with wider gold lace with a scalloped border. The sleeves themselves appear to be puffed by securing them front and back with a vertical line of three flowers, two light pink or white and one darker pink at the bottom, with a broad gold ribbon below the dark pink flower. Most of these trims are visible through or below the overdress in the card party scene, particularly when they are sitting at the card table and Mrs. Phillips reminds Mr. Collins that hearts are the trump cards. What is the odd type of hat that Darcy, Bingley, and Mr. Hurst put on their heads when they arrive at the assembly near the beginning of the movie? That’s a cocked hat, or a ‘chapeau bras’, which folded flat to take up less space at the opera or when held in a carriage. As adults had to wear hats when outdoors, these were typically worn only between the coach and the front door. The fold-flat style of hat became the collapsible opera top-hat later in the 19th century. The fore-and-aft style is almost never worn in portraits is it obscures the face too much (I can’t find a single portrait where the sitter is actually wearing the fore-and-aft hat, whereas there are several with the earlier side-to-side style) The picture linked below is of an officer of the 61st Regiment, one of those which served in the Peninsular War 1808-1814, and illustrates why these hats aren’t worn in portraits. 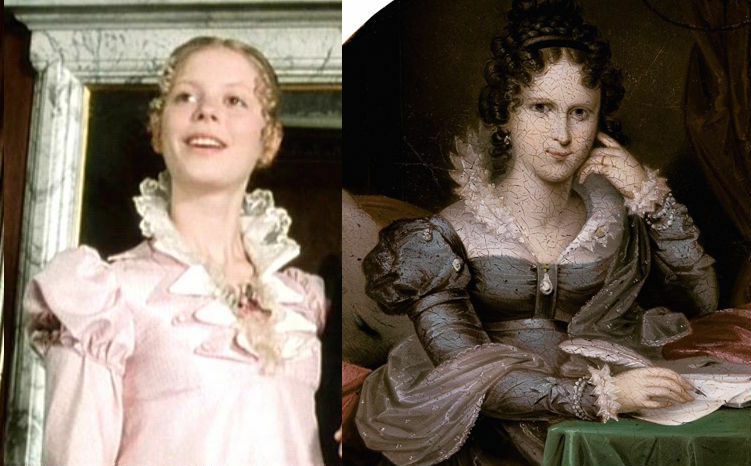 Has anyone else noticed that, in the scene that takes place in the inn at Lampton, where Georgiana invites Elisabeth to dinner, they are both dressed in the same colours? I’ve often wondered if that is symbolic of the close relationship they are to have in the future.